Note: All of this information was acquired via referencing the applications on the Pre, dissecting the Mojo sources available on the Pre, and possibly other publicly available information. The author of this guide has no access to, or knowledge of Palm's unreleased SDK, aside from what has been made publicly available so far. 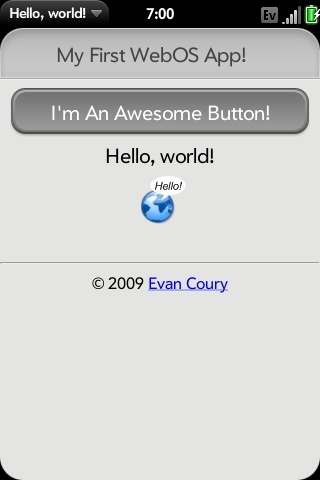 I'll start by walking you through building your first “Hello, world!” application for webOS from scratch, without copying an existing application and modifying it. Then we'll slowly get into the cooler, meatier parts of Mojo, so that you can actually start bringing your ideas to life. 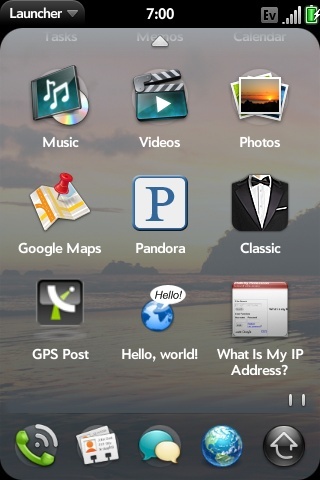 This guide will also cover how to “install” your newly created webOS application(s) on your rooted Pre. index.html – This file is really the first file that is run when your application is launched. It doesn't have to be called “index.html” since you specify the name for this file in your appinfo.json file. However, I think index.html fits well, and it seems to be what most (if not, all) of the existing webOS applications are using. icon.png – This is the icon that will be displayed in the launcher for your application. Like index.html, the filename doesn't have to be “icon.png”, since the filename for the launcher icon is specified in your appinfo.json file. That's it! Only three files to create a basic webOS/Mojo application... In fact, it would probably work without the launcher icon, but let's be honest... who wants an application without an icon? In a typical application (especially if you follow the Mojo framework's MVC structure) you'll have many more files and directories than this, but for simplicity's sake, we'll start with the basics. Anyway, now let's get started building our first webOS application. First, create a new, blank directory for your application. Note: Create this directory on your computer. We'll cover how to install your application on your Pre later. Now for the first, and arguably the most important part of your webOS application: the appinfo.json file. title String/Text Y This is the title used in the launcher, and also in the little gray tab thing that's always at the top left... what's that called, again? version Numbers x.y Y Simply put, this is the current version number of your application. This will obviously be used to manage OTA updates of webOS applications, and such. type web Y This is the application type... So far, the only value I've seen for this is “web”, even in more complex, plug-in-based applications such as Classic. This of course hints that there could be other options for this in the future, such as “java” or “native”, or who knows what else. This guide is only going to focus on “web”, though. main index.html Y This is the name of the html file you want to be have run when the user launches the application from the launcher. Typically, this will always be “index.html”, but there's nothing that says it has to be. id any String Y Now, this is a somewhat important one. This is your “Application ID”. Typically, is what this does, is gives the operating system a programmatic way of identifying your application. This must be completely unique, and it's suggested that you stick with the reverse DNS notation used in the existing applications. (ex. org.webosinternals.evanpro.app.helloworld). As a rule of thumb, I'd suggest keeping it all lowercase, and not using anything besides a through z, 0 through 9, and dashes for your application ID. We own the webosinternals.org domain, so you can use that reversed with your IRC nickname appended if you don't own your own domain that you can use here. icon file path N This is, of course, the path and file name of the icon you want to appear in the launcher. Simple enough, right? vendor String N The name of the person / company who made the application. vendorurl String N The URL of the aforementioned vendor. removable boolean, default: true N Tells webOS if this application should removable or not. noWindow boolean, default false N Indicates that this is a headless application that will be only called by other apps. TODO: Finish specifying which values in the appinfo.json are required and which are optional. Also mention what the default values for optional ones are. Additionally, add any new values as they're discovered. Next, either go find or make an application icon. 64 x 64 seems to be a good size for launcher icons, O'Reilly's book states that the icon's image should be about 56 x 56 pixels within the 64 x 64 png bounds. PNG's with alpha transparency obviously will look the best. Note: if your icon is smaller than 64 x 64, I believe the launcher will stretch it to 64 x 64, causing it to look fuzzy or pixelated. <!DOCTYPE html PUBLIC "-//W3C//DTD XHTML 1.1//EN"
You'll notice that webOS lets you use the exact same HTML / CSS as you would if you were simply developing for a browser. Really, if you're just doing some HTML / CSS stuff, and don't wish to use Palm's pre-built UI styles, then you really don't even need to include Mojo... but then what's the point? I don't have a list of all of the palm-* CSS classes, but they're very easy to find by referencing the existing applications. Other than that, everything else is just normal HTML and CSS, exactly how you would use it on the web. One thing to note is how I referenced the application icon from within the application using a simple <img> tag. You do not have to have your CSS styles in-line like the example. For example, you could create a “css” subdirectory to hold all of your CSS files. Then you can use <link rel="stylesheet" type="text/css" href="css/styles.css" /> in the <head> just like normal. You may include and use jQuery (and other JS libraries, I'm sure), but make sure to include it before Mojo, and use jQuery.noConflict(); since Mojo uses Prototype (TODO: Add jQuery example). Rename the source directory to match the "id" tag defined in the //appinfo.json// file. * Reboot the Pre ( ##FF5500|Orange## + Sym + R ). * As root, from a shell, execute //initctl stop LunaSysMgr// to stop and //initctl start LunaSysMgr// to restart. echo "rescan the the launcher's cache"
echo "tail the log file just in case"
Tips for speeding up the development process with remote JS files (while we wait for the SDK). Deeper examples into the Mojo MVC structure (controllers, scenes, etc) and using phone-related functions (GPS, messaging, etc). Can this open method of the appMgr service execute shell cmds and if so how? Can we get some code samples? Note: Despite the //fake// copyright notice in the sample application, the code in the preceding example(s) is released under the MIT license. This page was last edited on 16 July 2011, at 06:44.